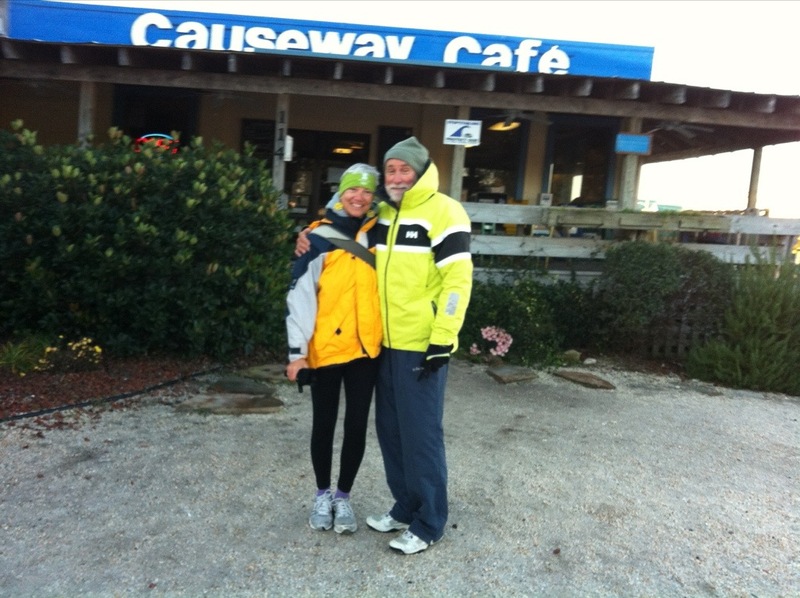 After yet another sub-freezing night we forced ourselves to launch the dinghy at daybreak and motor ashore, then walked a mile to the Causeway Cafe, recommended by cruisers as the best breakfast on the East Coast. 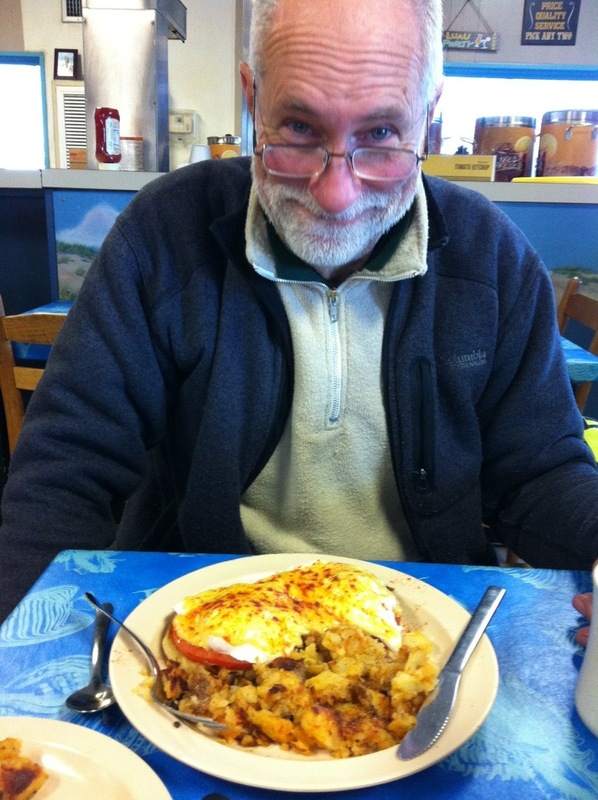 Jack ordered “Eggs Neptune,” a version of Benedict with crab instead of Canadian bacon. He loved it. Unfortunately, my breakfast sucked. I ordered Cinnamon Raisin Sourdough French Toast. It came dry and cold to the table. I sent it back but it wasn’t any better when it was returned. It was clear it wasn’t made to order, probably frozen and reheated. I was very disappointed because I love French toast, hot, sizzling and crispy off the griddle, creamy inside. This was not that. It was inedible, and the waitress was so clueless when she saw I didn’t eat it that she asked if I wanted a box to take it home. I let the hostess know it was bad, and she took a look and agreed it didn’t look right, but didn’t take it off the check. Too bad. I was geared up for a killer meal, but my vote for best breakfast still goes to Pamela’s in Pittsburgh. 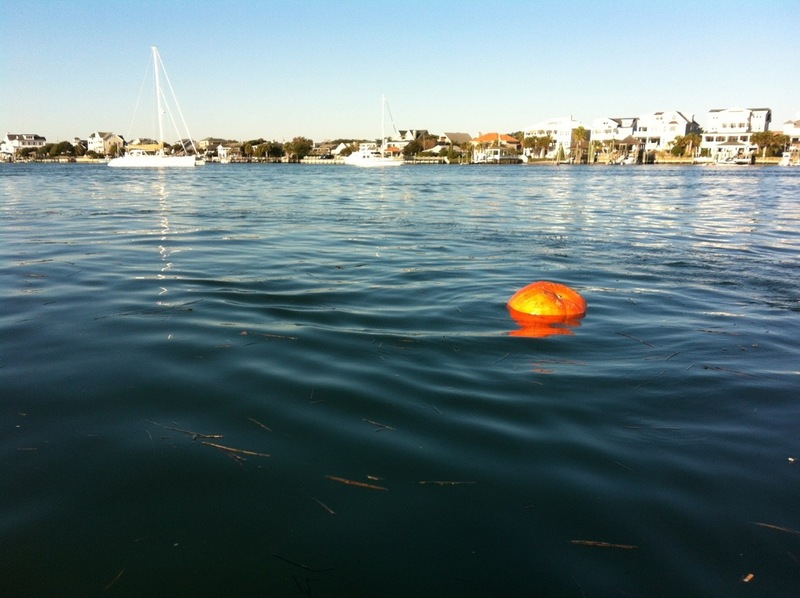 On the way back to the boat we passed a floating reminder of Thanksgiving. We were underway by nine and back in the ICW by 9:30, right on schedule. 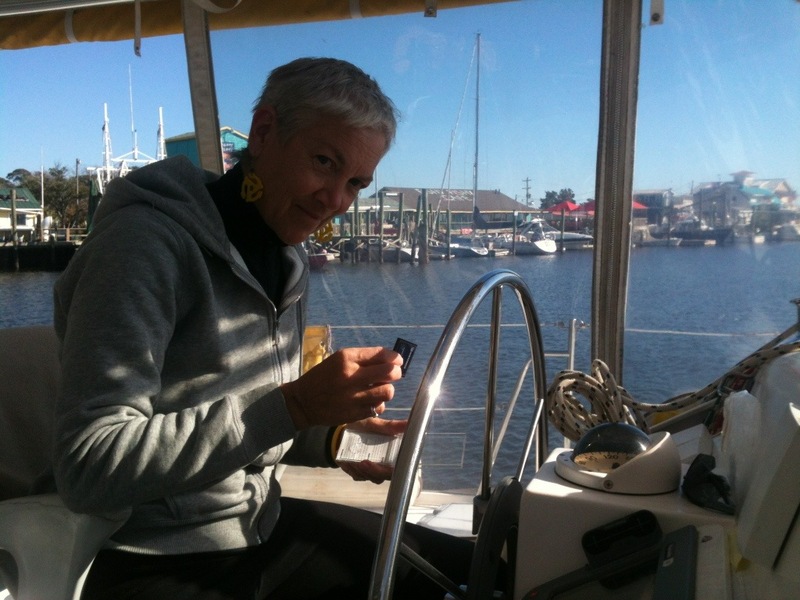 Today we had to time our passage to be sure we had a favorable current down the Cape Fear river. For most of the way we kept alert for shoaling at the many inlets. We poked along through shallows at least four times but luckily never hit bottom. Our timing for the river was perfect. We had a few miles of wind against current which makes it a little bumpy, but it didn’t last long. We arrived in Southport by 1:00 and circled the tiny town anchorage before deciding to drop the hook in this very tight space. We’ll be here for two days while we wait for the wind to clock around for a fair passage to Charleston and we needed to be sure we have swinging room for the change in wind direction. 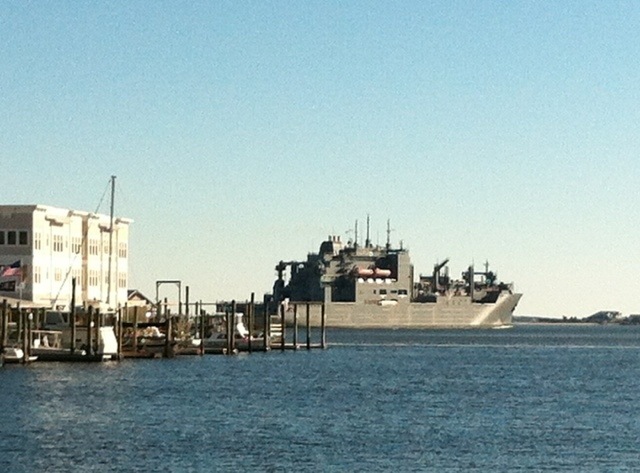 We have a great view out toward the Cape Fear inlet, and saw the USNS William McLean, a dry cargo and ammunition ship, leave port while we ate lunch. 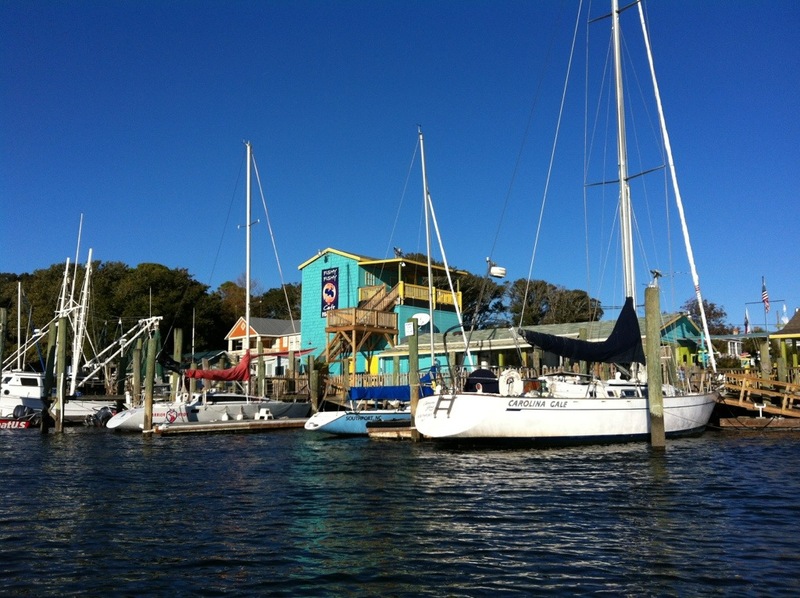 We went ashore and took a little walk around town. When we got back home I realized I had two different shoes on. On my left foot, a Brooks Ariel, on my right, a New Balance 940. Not even close! And different colors, too. I’m going to have to watch that. We crossed a bit of a milestone today. We had to change the card in the chartplotter from “MidAtlantic” to “SE US including Bahamas.” I always get a little nervous doing this because they are old compact flash cards with the multipin connector that failed on us last July. I was very gentle and the changeover was successful. 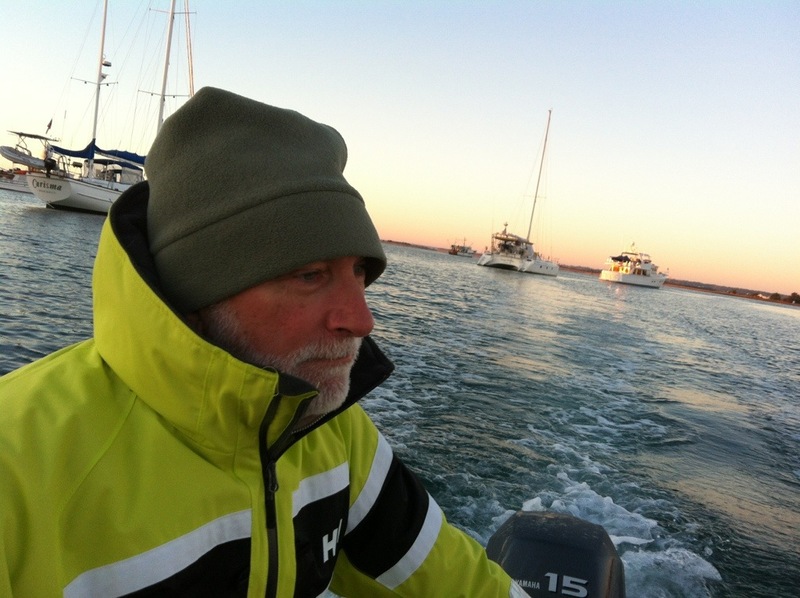 Tomorrow we’ll do a few boat chores and I’ll cook some meals to reheat during our short passage. It’ll be another cold night but sunshine again tomorrow. 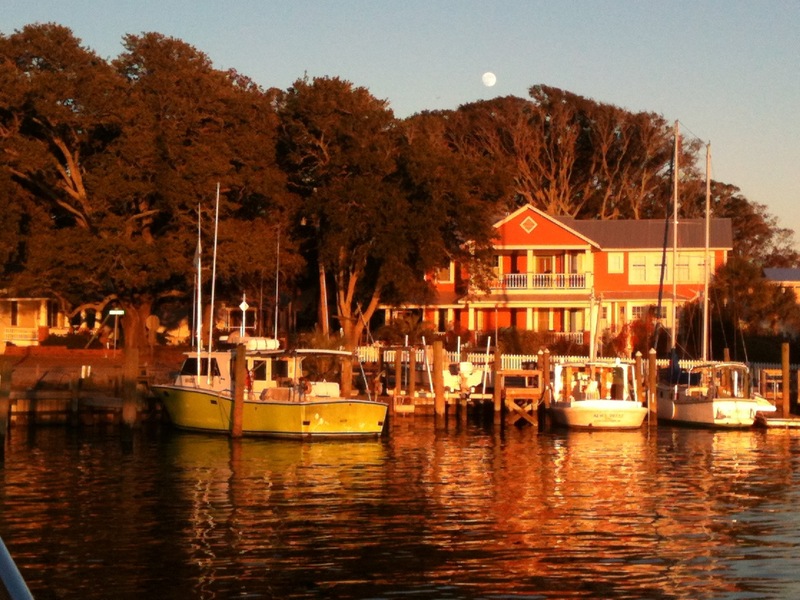 Setting sun, rising moon over Southport, NC.